Grammy-award winning hip hop artist Will.i.am jetted into Auckland for a company party last night, but he’s not going home without leaving something behind. The Black Eyed Peas frontman has donated $100,000 to a network of low-decile schools in the city’s low-income areas toward providing children with new computers and iPads. 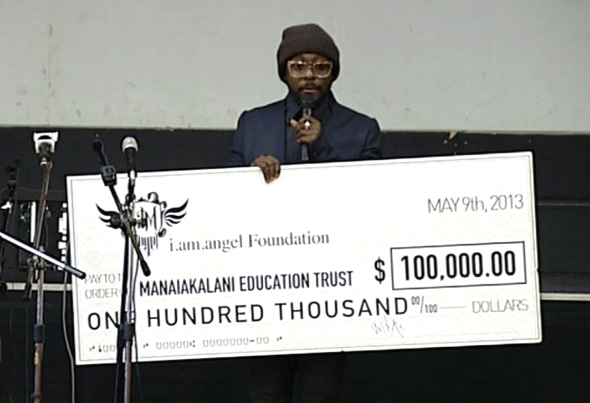 He surprised the children at Point England Primary School where he handed the cheque over to the Manaiakalani Trust this morning. The trust will spread the money across nine schools in Auckland’s Glen Innes, Pt England and Panmure – the city’s oldest state housing communities where 95 per cent of the students are Maori and Pasifika. Growing up in a “the projects” of East Los Angeles, Will.i.am, real name William Adams, said he could easily have “ended up in prison” but by surrounding himself with good friends and a support group, he was able to become a success. “Music and arts literally saved my life,” he said. And now he’s trying to better the lives of Kiwi kids too by giving them a “jump-start” and encouraging them to become scientists, mathematics and engineers so that they can compete in the technological future. “What’s coming is something that we haven’t seen in humanity – this technological revolution that is transforming society as a whole. As the world advances, kids in inner cities are left behind and not even given the tools to compete in the future that we are walking into,” he said. The singer has a passion for science and technology and plans on going back to school in September to study computer science. He’s tossing up between MIT, “where all the wizards go”, or California Institutes of the Arts on his home turf. Last year, Will.i.am teamed up with NASA to premiere his song, Reach for the Stars, from the Curiosity rover on Mars. It was transmitted to Earth via radio waves. The song was part of a special educational event for US students when he teamed with the space agency for his i.am.FIRST programme. Will.i.am was in New Zealand to perform at the Hallenstein Brother’s “Ultimate After Party”.